Here it is…the last resolution post of 2014. Whew, what a relief! Tomorrow marks something of a new beginning here and I certainly am glad to be starting with a sense of resolve – at least in one little corner of my life. Other corners are teeming with the debris of homemade valentines, I’m still not sure what I was thinking…..
delicious and nutritious facial – really! Okay, it bears repeating that I’m a cream junkie. With my dry sensitive skin, there’s no other way. Lucky for me, my obsession has led me to learn a lot and today I’m sharing what I know. 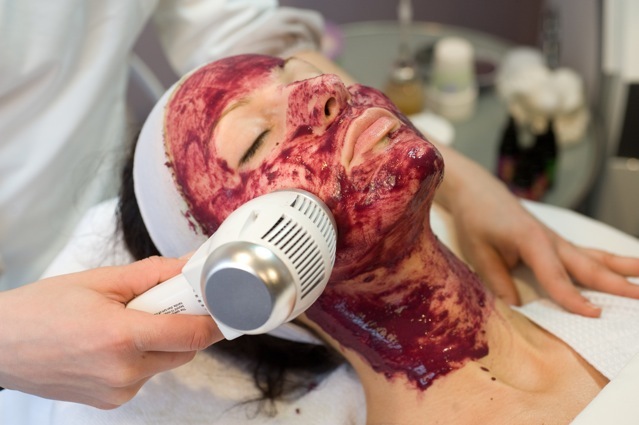 This is a follow up post to Why I Love a Good Facial. I fell in love with Elina’s products in a short amount of time. Given that Shelley and I were small business buddies, I would often pop into her space and I always would stand and gaze longingly at the display of products. It wasn’t long before I was exclusively using Elina’s products and loving them all the more. I haven’t strayed since. Since I haven’t had a facial nearly three years, Elina’s products have really had a chance to prove their efficacy. But first a little back story. As a teenager who avoided the sun, I was mercilessly teased for never sporting a tan. These episodes didn’t bother me much, for I had plans to have a beautiful complexion far into adulthood – perhaps the teasing fortified my determination. Now that I’m in my late thirties, I feel satisfied with my action plan and thankful that I found the support of Shelley and Elina. Over the years I got to know Elina and learn more and more about her products. Given that her business is based in my home state, I’ve enjoyed many a treatment there. I even attended one conference before my ability to travel became more limited. The more I learn, the more I love what Elina offers. And the more convinced I am that she has created a line of products that stands shoulders above all the rest. As far as I can tell, there are three characteristics that set Elina’s line apart from the rest: they are 100% high quality ingredients, organic or wildcrafted in all cases which change seasonally so that the body is always stimulated; they are 100% transdermal which means that instead of all that goodness resting on top of your skin it sinks right in where it will be best utilized; and they have the added beneficial bonus of being bioenergized. While I certainly believe that each of those three characteristics are essential for the high quality products that Elina makes, I have come to think that the transdermal quality is the most important. Here’s the thing: wax, a very common ingredient in skin care products (check your labels and recipes), is not good for our skin. Like everything else in our bodies, our skin is designed to be constantly changing. This change happens from layer to layer as materials pass through the layers of our skin. When we put wax on our skin it feels good and smooth from the outside, but it severely inhibits that flow which is the basic function of our skin. It may be obvious, but I’ll say it anyway, it doesn’t make good sense to inhibit the basic function of any part of our body. And since our skin is our biggest organ and we spend most of our time fully clothed (unlike Joe Pilates), it makes even less sense. If the products one uses have toxic ingredients this is a good thing because the wax is limiting your exposure to those ingredients. But if you’re using products with high quality ingredients and wax, then you’re creating a case of double deprivation with each and every application. Here’s something that happens when folks begin using Elina’s products, their skin feels different. Often, dry. This is because their skin is incredibly thirsty for real nourishment since the wax that is in most creams has been keeping all the moisturizing goodness from soaking into the skin. Once the skin actually gets the opportunity for nourishment and proper function, there is repair work to be done. So it’s reasonable to expect something of a gradual result when beginning to use Elina’s products. It’s also important to use the ones that match your body, that’s why Elina’s products are sold through licensed aestheticians. The transdermal quality of Elina’s products means that all the power of the ingredients can be absorbed and utilized by our bodies. This is no small statement. I remember when Shelley made the transition to using Elina’s products in her treatments and sure enough, the results were immediately apparent. While I am certainly of the camp that respects and honors the power of nature, I have learned that a certain base of knowledge is required to fully exploit what mother nature offers us. I believe that this is what is meant by the notion of advancement. It’s not just a matter of developing new things, it’s also a matter of developing a deep base of knowledge about what is already here and putting the two together. To me, that is the most exciting kind of innovation. I believe that Elina is one of the few people in our time who works with this idea in the arena of skincare. I realize that there is a movement toward making skin care products at home. While I love a DIY project as much as the next person, after years of blemished skin, I am wholly committed to using more sophisticated products. Elina has specialized knowledge as a cosmetic chemist, aesthetician, and herbalist, far beyond what we common folk can apply to making our own products. Her Russian heritage gives her access to ingredients from distant places and the knowledge that goes with how to best use those ingredients. Elina is also an incredibly generous and positive person, and she consciously infuses each and every batch of her products with that positivity. Somehow, I believe that I sensed that all way back when I first started using her products, but now I know so much more about the how and why of what I’m using on my body (this book provided supplemental information on the topic, both Shelley and Elina were interviewed by the author). And that has given me a real sense of appreciation and respect for the products that nourish my skin every day. Your skin is your largest organ. Use organic products on it that are good for your entire body. Develop a regimen and make it a habit (see my post on Shelley for some tips on what this ideally includes). Exfoliate! – make that a part of your regimen. This entry was posted in Body Sleuthing on February 13, 2014 by elizatwist.